This is another one of those recipe ideas that’s been hanging out in the “Notes” on my phone for… way too long. Because when the word “Nutella” is involved, there should be ZERO waiting. Just a very hurried sense of need. They say haste makes waste, but if you’re not hasty when it comes to Nutella, you’re going to miss out. In fact, sometimes I wonder if ever there will be a Nutella shortage, and the fear is real. I just hope it’s never a real possibility. 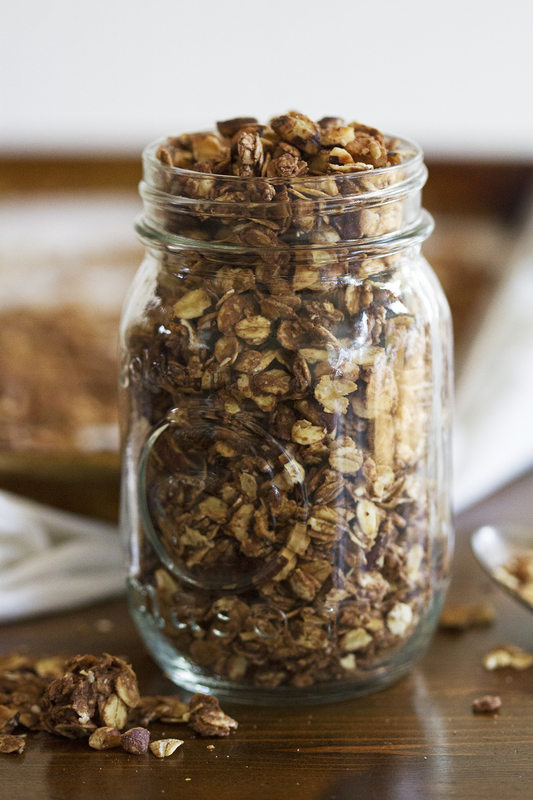 Anyway, this 5 ingredient Nutella granola situation is just that. Five simple ingredients: oats, toasted hazelnuts, sea salt, Nutella and olive oil. Mix them all together, spread the mixture on a baking sheet, bake it in the oven and let it cool. That’s the hardest part, really. 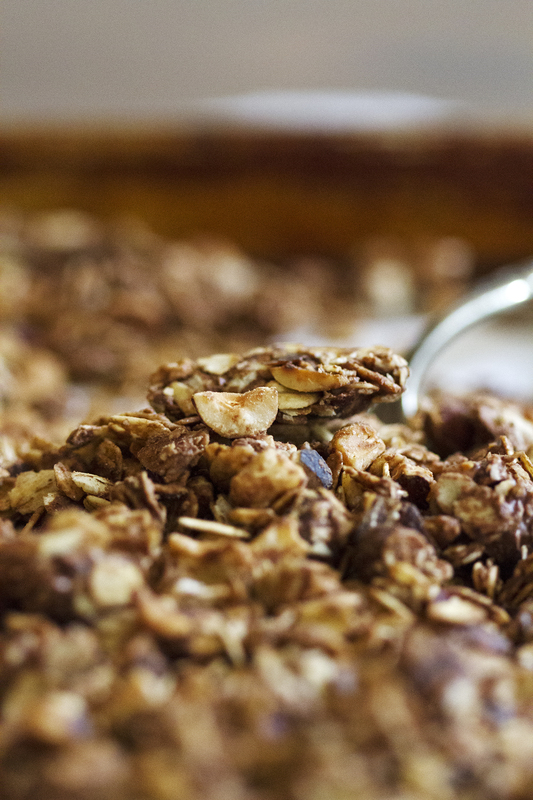 But it’s crucial to NOT TOUCH THE GRANOLA until it’s completely cooled, so as to form crunchy clusters throughout. Those clusters, you guys. They’re PURE GOLD. So every minute of waiting is necessary. You can get through this. I believe in you. And if you just can’t wait, you can come over to my place where we have just a few handfuls of our batch left that we hadn’t had a chance to devour over the holiday weekend. But hurry, because there are three people in this house who might beat you to it. Or maybe it’ll just be me who does. I have no mercy when it comes to Nutella. Heat oven to 275 degrees F. Line large rimmed baking sheet with parchment paper. In large bowl, stir oats, hazelnuts and sea salt to combine. Use wooden spoon to stir in Nutella and olive oil until well combined. Spread mixture in thin even layer on prepared baking sheet. 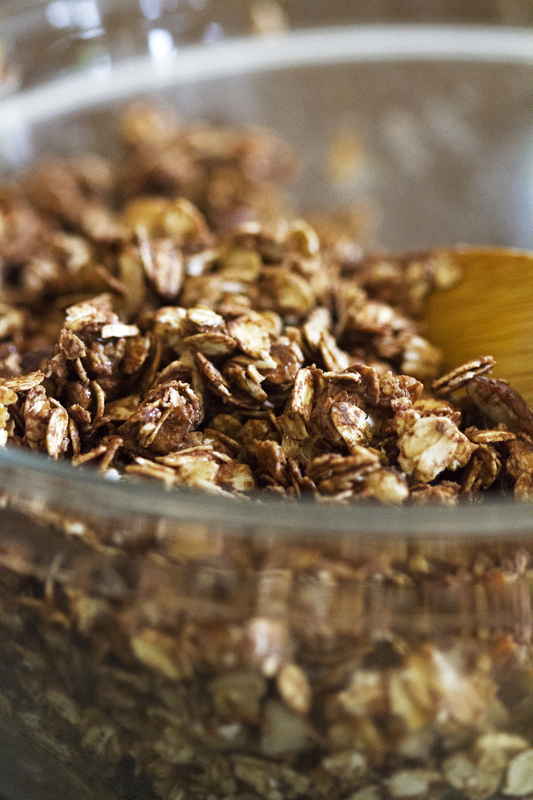 Bake 40 to 45 minutes, stirring halfway through, until granola is golden brown. Cool completely on baking sheet (do not stir so clumps can form! ), about 1 hour to 1 hour 30 minutes. 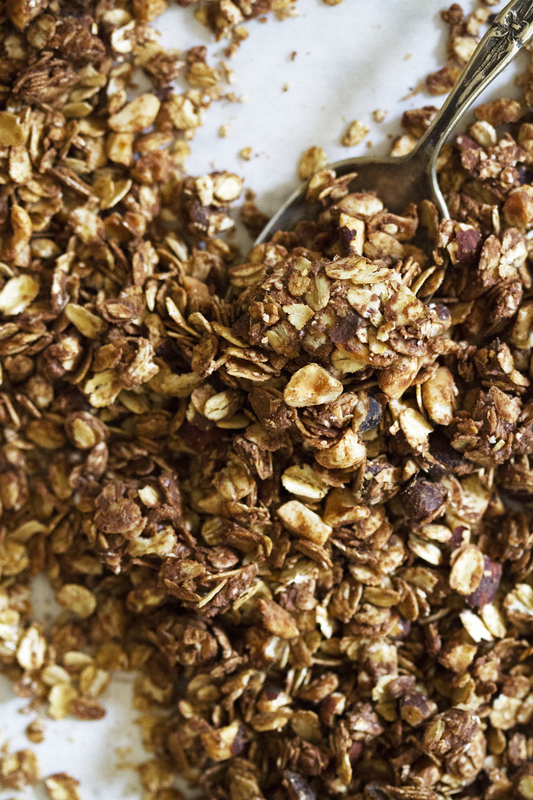 Store granola in airtight container at room temperature up to 2 weeks. *To toast hazelnuts, stir hazelnuts in skillet over medium high heat for about 3 to 5 minutes until hazelnuts smell toasted and start to brown. Immediately remove from heat. Mmm Nutella in granola?! Amazing! This looks sooooo tasty. I definitely need to try! I thought I heard something about there being a possible nutella shortage last year. Luckily it seems that we’ve passed that hurdle. This looks divine for summer snacking. Is there anything that cannot be made better by the addition of Nutella? Wait, don’t answer that – I’m sure there is. However, granola does NOT fit into that category. This sounds unbelievable! Katrina — It’s my new favorite way to eat Nutella, and granola. 😉 Thanks, love! Allyson — Say it ain’t so! Well I’m glad we’ve moved past that. 😉 Thanks, dear! Roxana — Truly. 😉 Thanks, friend! Mary — Haha, very few things are not made better by Nutella. 😉 Thanks! 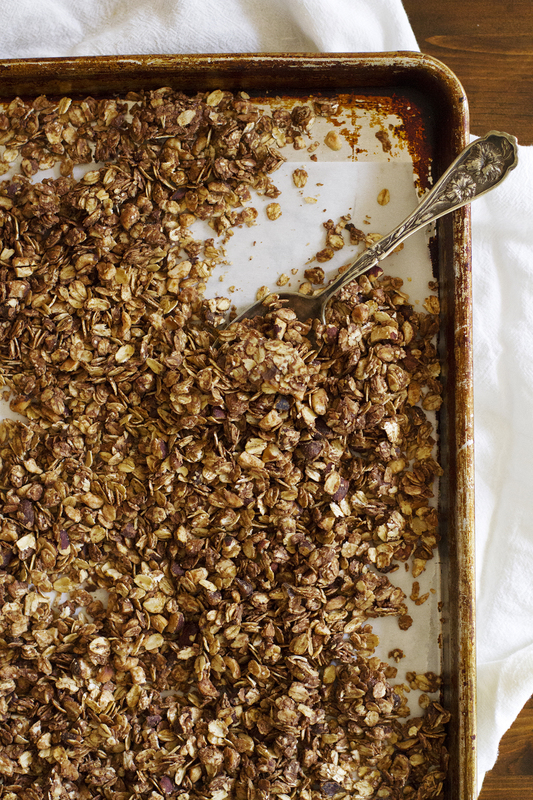 You had me at Nutella, this granola is everything!